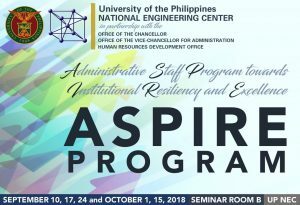 The University of the Philippines (UP) Diliman Office of the Vice-Chancellor for Administration (OVCA) through the Human Resources Development Office (HRDO) partners with the UP National Engineering Center (NEC) for the development and implementation of the pilot run of the Administrative Staff Program towards Institutional Resiliency and Excellence (ASPIRE) Program. The first day of the program was held last 10 September 2018 at the Seminar Room B, UP NEC. The program was designed to equip participants with the necessary knowledge, mindset and skills in developing and implementing a Quality Management System that will help their organizations attain improved and efficient operations, a sustained culture of innovation, customer-driven delivery of services, and empowered human resources. In addition, the program also aims to help the UP Diliman OVCA in crafting the criteria for its Foreign Fellowship Assistance for Administrative Personnel. The pilot run covers 50 participants who are affiliated with service units under the UP Diliman OVCA. These include the UP Diliman HRDO, Accounting Office, Budget Office, Cash Office, Supply and Property Management Office, and some colleges. The 50 participants were selected based on accomplishment of online self-assessment tool, submission of supporting documents such as curriculum vitae and endorsement letter, status and type of position (must be permanent administrative personnel), principle of equal opportunity, capability to perform as trainer, and skills to innovate solutions. From the 50 participants, a number of participants will be selected to participate the benchmarking activities in November or December 2018. These participants will be evaluated and selected through performance in the ASPIRE Program, presentation of outputs, and results of Personality Assessment Tool (Mapa ng Loob). UP NEC Executive Director Dr. Rizalinda L. de Leon welcomed the participants and shared how happy she was for this kind of initiative. 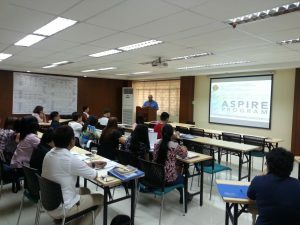 Present also during the first day was UP Diliman HRDO Deputy Director Dr. Augustus C. Resurreccion who relayed to the participants the background of the program as well as the expectations to them. UP Diliman HRDO Deputy Director Dr. Resurreccion giving his message and reminders to the participants. Dr. Resurreccion further enlightened participants, “You are not only here to listen, participate, receive your certificates, and update your resume. You are here because we would like you to be our partners for change; partners who can spur improvements and innovations in your respective offices, partners who will be committed to delivering quality services, and partners who will be prime shakers and movers towards institutional resiliency and operational excellence. The program will run on September 10, 17, 24, and October 1, 15, 2018. UP System Quality Assurance Officer Dr. Aura C. Matias, Assistant Professor Adeline A. Pacia, and Philippine Quality Award Assessor Engr. Vito P. Aberin are the program developers and resource persons of this year’s ASPIRE.